Making the leap into sales management means meeting a whole new set of challenges. As a manager, you're going to have to quickly develop the skills that allow you to build and supervise a sales team, communicate effectively, set goals, be a mentor, and much, much more. Now that you've been handed these unfamiliar responsibilities, you're going to have to think on your feet -- or face the possibility of not living up to expectations. 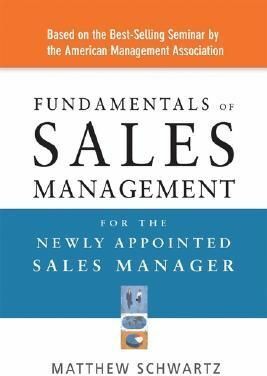 Easy-to-understand and filled with realistic examples and immediately usable strategies, Fundamentals of Sales Management for the Newly Appointed Sales Manager helps you understand what it takes to be a great sales manager, allowing you to avoid many of the common first-time sales management mistakes, and be successful right out of the gate. Dispensing with dry theory, the book helps you understand your new role in the organization, and how to thrive simultaneously as both a member of the management team, and as a team leader. You'll learn how to: - Make a smooth transition into management. - Build a superior, high-functioning sales team. - Set objectives and plan performance. - Delegate responsibilities. - Recruit new employees. - Improve productivity and effectiveness. Based on the bestselling American Management Association seminar, the book supplies you with indispensable, need-to-know information on communicating with your team, your bosses, your peers, and your customers; developing a sales plan and understanding the relationship between corporate, department, and individual plans; applying crucial time management skills to your new role; managing a sales territory; interviewing and hiring the right people; building a motivational environment; compensating your people; and understanding the difference between training, coaching, and counseling--and knowing how to excel at each. You can't make the leap into sales management successfully without the proper tools and information under your belt. Fundamentals of Sales Management for the Newly Appointed Sales Manager gives you everything you need to win the respect of your peers and colleagues, and immediately excel at your challenging new responsibilities.